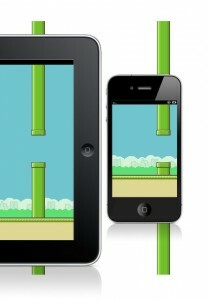 Great Tutorial, i’ve learned allot about the ios sprite kit from this. Is it difficult to add a main menu to this game? Great work and it’s very useful for me who is just starting to learn the sprite kit. But where i can download the source code? i can’t find out the link. I would like to download the image assets for this tutorial. It says at the top they can be downloaded with the rest of the project. Where can I find them? Thanks, it looks like a great tutorial. I have pushed the tutorial code to GitHub, link is at the bottom of the tutorial. When are you putting the score counting part of the tutorial up? Absolutely love the tutorial! Though there were some various problems throughout the walk-through (e.g., differently named variables (I think you listed groundTexture as “bottomTexture” at one point), missing bits of code, etc. )., it was an excellent read, and I’m going to take a lot away from it. @Ryyydizzle, not really. This tutorial is about the game mechanics but I may extend it with some menu code. @Mark, as soon as time permits. The basic concept will be: add an invisible rectangular physics object with it’s own category right of each pipe pair and increment the score every time a contact with this object is detected. @Syrinathos, thanks, fixed. I did some renaming before I wrote the tutorial and I missed that one. Any other issues you’ve encountered? I’d recommend adding ‘_bird.physicsBody.velocity = CGVectorMake(0, 0);’ to touchesBegan. Otherwise the impulse gets added to the current velocity of the bird node, leading to bigger jumps the more often you tap. I like your code, especially the _moving part and animation! Do you know how to adjust the gravity and impulse so that the bird running normally? @ET Worker, please see Sascha’s comment right above yours for a solution. @Daniel Bocksteger, yes, I already sketched a solution above, see my response to Mark. I will possibly add it later tonight. @Matt: Not as far as I can recall, no. The only other one that stood out in my mind was the _movePipesAndRemove having been different between one block of code and the next, but you seem to have fixed that as well. In addition, another item that wasn’t covered was the lack of a distinct ceiling within the game world. As the project stands now, the player can simply fly over all the pipes and not have to worry about collisions of any kind. I made a crude work around by ensuring that they cannot apply the impulse if the Y position of the bird is within 100 points of the top of the screen, but if they tap quickly enough they can still fly up into the ceiling until gravity yanks them back down. I’m thinking another invisible node running along the top of the scene moving with the bird to count as another physics body would be in order. Regarding the score counting, wouldn’t it be easier to make an instance variable that gets incremented as each pipe is removed from the scene? Logically speaking, if the pipe has been removed, you’ve already passed it. how much longer until the score part is added? @Syrinathos, yes, I discussed the ceiling issue on Twitter, too, and I will add some information on how to avoid that. Score counting would be easier that way but it would cause a recognizable delay, too. 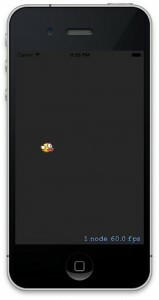 @Syrinathos: Regarding the bird flying off the screen, simply restrict the bird to the self.frame or in other words restrict it to the frame of the phone. About the score counting, its very easy to implement, like @matt said, all you need to do add an SKNode to between the pipes and make a collision category for it. When the bird collides with the SKNode, just increment the score. @matt: Great tutorial! Love the way you have explained everything in detail with illustrations of the progress. Keep up the good work! it is help me alot! but it takes no effect. @Nico, do it the other way around. First set the velocity to 0, then apply the impulse. but i have to change the impule from 8 to 4. now its perfect! Thanks for this awesome tutorial. 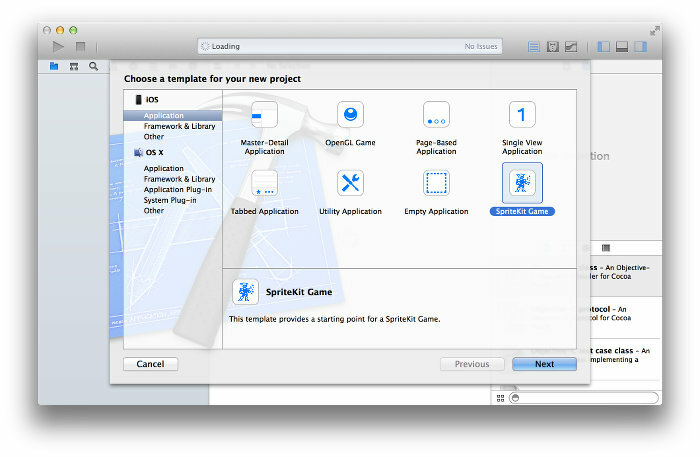 I always wanted to look at SpriteKit but never did. This is a cool example to dive in. I have one question though regarding the velocity. At some point you do this “* ( _bird.physicsBody.velocity.dy < 0 ? 0.003 : 0.001 )" to rotate the bird sprite in the correct direction. If I don't do this (which is what I first tried because that's how I'd have done it) the bird is constantly facing down and start moving forward on the x axis. Adding this part of code makes it correct but I don't understand why. Could you try to explain it to me ? @Anthony, I can only guess because my code works fine even without the rotation code. But your scenario sounds as if your scene is rotated by 90 degrees Also check that your bird’s physics body has allowsRotation = NO set and that you’re calling applyImpulse, not applyAngularImpulse. Thanks Matt you were right. I had allowsRotation set to YES instead of NO. Changing it solved the problem of the bird going forward when hitting the ground. I guess an angular velocity was automatically added by the physics engine when birdy was hitting the ground. Hi, This is a fantastic tutorial. Can you add a bit on about how to do highscores etc. Hi, nice tutorial. Thanks Matt! I’ve added a highscore function in my fork at github. I was wondering how you did the art work? I know you used gimp but could you quickly go through the steps of what you did? I am having an issue with the skyline and ground as well. I need the dimension sizes and I cannot use Gimp. My current images are not loading properly for the sizes. Help? @TimoP, nice enhancement! Hope that solves @Rob’s question as well. @Tim, check that bird and ground have proper categories set up and that the didBeginContact method properly distinguishes both. 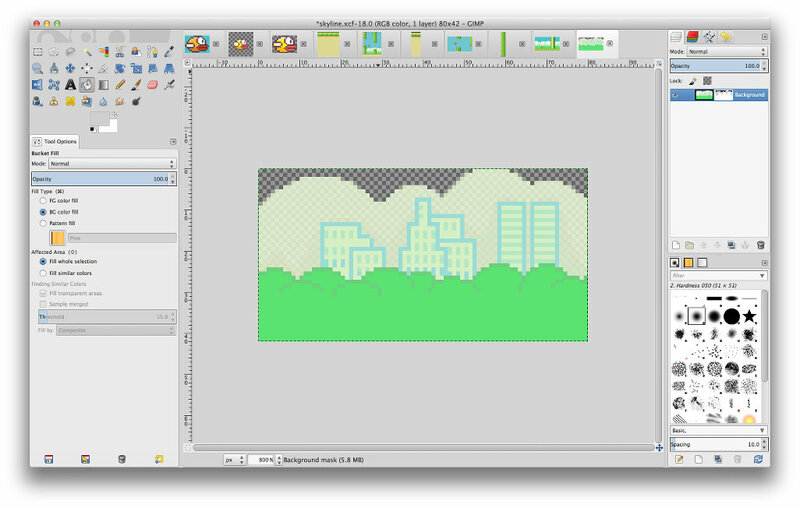 @Andrew, I loaded some screenshots into Gimp, created images with transparent background and started placing pixels similarly to the original game sprites using the Color Picker Tool for color selection and the Pencil tool with brush size 1. The bird was the easiest because I found some good images without JPEG artefacts etc., but I couldn’t find a good sample of the city background so I created that one with an own pattern but with similar colors. 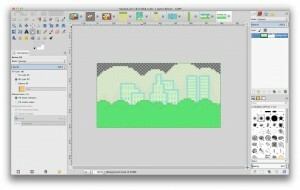 @juice, skyline is 80×42 pixels and ground is 18×48 pixels, but remember that I scaled everything up ingame with factor 2. The code is written so that the image dimensions shouldn’t really matter, though. I guess I do not understand your problem yet. My images are not lining up properly on the simulator. My ground image is taking up so much space that there is only 20% of the background color visible. I am very new to this coding and I guess I don’t understand the sizing within the code. I resized my image to match yours and I am still getting the oversized images. when i build it all of the images on the test screen show as a red x!! Where do i place these actions? @chse, best is to download the project (see GitHub link at the end) and compare the final Scene.m code with your progress. is it main.m, myscene.h/m ? how can i add a menu? and a score list ? @chse, I may add another chapter on that, if time permits. @bosss, look into ViewController.m, there are two lines setting showsFPS and showsNodeCount to YES. Change that to NO. As a newbie, i spent a whole afternoon plus a morning to follow through this great tutorial. 1. That collision bit mask and bitwise shift stuff are just too much for me. I could’t understand it. 2. rotation animation looks hard to understand so i just passed it. There is a minor problem at the part when we add the moving objects to a parent node so we can pause the game. this line of code. i was confused when i saw that & symbol. so i looked it up then realized it returns the address of the following object. as this looks more understandable to me. and i found out it worked as well. nothing changed in the game. it just used & instead of == or other alternate ways. so i assume that, functionally speaking, & and == are same here ?? please correct me if so. pass through invis score block , will cause score add up by 4 instead of 1.
this is so weird. i couldn’t find out where the problem is. 1. Once you got it, bitmasks are really easy. We create them by shifting a bit x times “to the left” with the “shift left” operator “< <", like 1<<0 = 1b, 1<<1 = 10b, 1<<2 = 100b, 1<<3 = 1000b, etc. (b for binary). Now we test if the bit is set with the binary "and" operator (a & b) --- it is NOT the "address of" operator in that case. "Binary and" compares all bits and leaves only those which are set in both operands, so 100b & 111b would become 100b. So if we're testing if the object's collision bitmask is e.g. scoreCategory, we "binary and" it and check if the result is equal to scoreCategory. Alternatively you can simply check if the result is != 0 and do a shortcut by making use of the fact that in C, for an "if" condition, any numeric value != 0 evaluates to "true", which is basically what you saw in another tutorial (i.e. if (1) -> true, block will be executed, if (0) -> false, block won’t be executed). 2. Rotation angle calculation takes the current vertical velocity (i.e. the amount of movement up or down), multiplies it with a certain factor to scale it (factors were figured out by experimenting) and clamps it… One needs to note that rotation is in Radians, i.e. 0..2*PI for a full circle. Does this make it clearer? 3. The animation is built out of several individual SKActions. You can try to split them up to get a better understanding. Regarding the score counting: it seems that the contact is detected four times instead of one time, which is weird, since didBeginContact should be called exactly once per contact. Reason could be multiple overlapping “score count objects”. You could log the collision entities for a single “score contact” and I guess you would see that it’s always a different object. 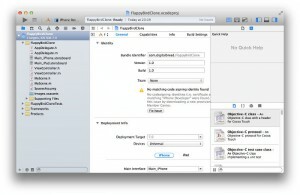 Check your “score object” creation. @Bennett Taylor, @chse, I may add it if time permits. You can watch the GitHub repo to get notified if I make updates. 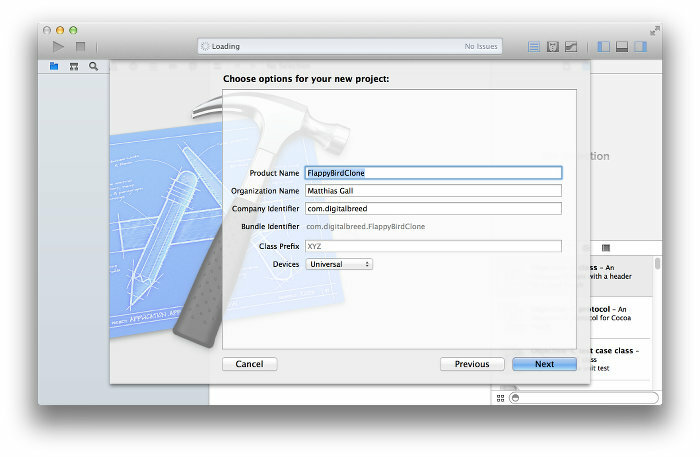 @chse, @McGee, seems like you haven’t added the required graphic files to the project. Also check the casing (ground vs Ground). After log through many kinds of possibilities, i found nothing. i got lots of warnings tho. and there was one just about _score. i just removed that * and warnings’ gone. can you explain that for me ? what’s the difference between ‘*’ and ‘no *’. i thought i had to use * in any situation. really curious about why I was getting 4. Hi Matt, Solved the highscore problem! Please do a title screen/page this w/e? I learnt a lot from this tut as my first project on ios. when i first saw this, that just looked intimidating. But i calm myself down later, and look it up. hey that was just a shortcut for “if” ! error: could not read data from ‘/Users/Luki/Desktop/how-to-build-a-game-like-flappy-bird-with-xcode-and-sprite-kit-master/FlappyBirdClone/FlappyBirdClone-Info.plist’: The file “FlappyBirdClone-Info.plist” couldn’t be opened because there is no such file. I need some help… When i start the game is there anyway i could make it so you have to hit start instead of it starting automatically? Thanks if you can help!! Nice tutorial, you may add as a scene change or level once you reach the end of a level no ..
A start menu and an end menu would be great!! Thanks!! anybody know how to add a start and game over menu if so please comment i have no idea how to thanks!! 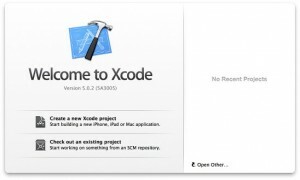 if you’re asking whether you can use the tutorial code to release your own app, no worries, you can do whatever you want with it. The art should be replaced, though. And just mind you that the tutorial is far from a complete game, there are lots of bits and pieces missing. What do you meant with “And just mind you that the tutorial is far from a complete game, there are lots of bits and pieces missing.”? Can it not be released on app store yet? Is it not compatibility with iOS 7? And can you please help me to add start menu and a end menu with high score. This is really helpful and great tutorial. 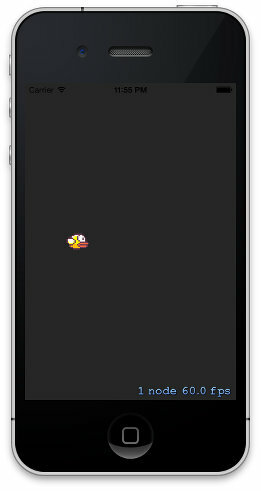 I am kinda new to iOS game programming and have done little with the cocos2d but now loving the SpriteKit more than cocos2d. why do we need to do 1 << 0, 1 << 1 and 1 << 2 ? and why do we need these variables? May be I was missing something but could not get this part. hello does anyone know how to play a sound when the bird goes threw the pipe and when you click on the screen? I sometimes experience that the bird stop flapping. Only static “flapping” with no animation. Anybody experience the same thing? 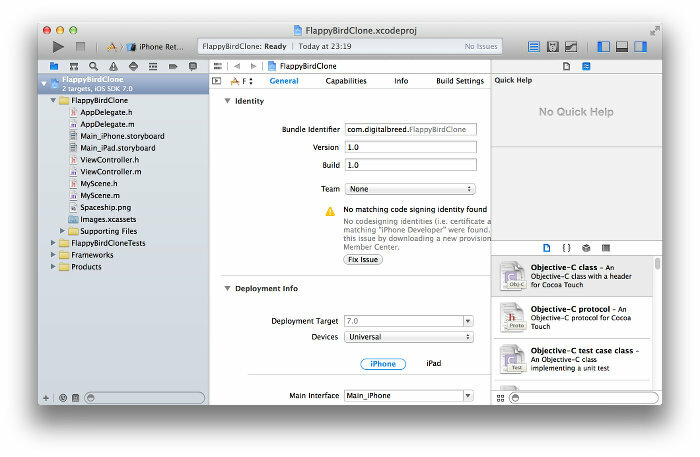 Awesome tutorial…the only thing I notice is that you’re not using the typical best practices in creating different classes for the different aspects of the app, other than that, well done. I am learning objective C from scratch and so far learnt how to write simple programs for Mac OSX. 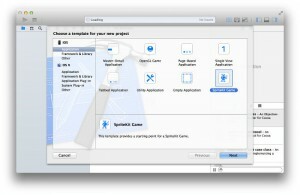 I just wanted to get some advice on what resources to use for learning iOS game development (like what books, guides etc) after I’ve learnt the language. Loved this tutorial by the way! Great tutorial! I’m still learning objective C, too. Please have a hint what I have to do to see the pipes in front of the ground. Is this possible? @Stefan, the ordering of sprites is determined by two things: 1. the scene hierarchy (implicitly through the order of adding nodes to the same parent or explicitly through parent-/child-node-relations) and 2. the zPosition property of a SKNode. In the tutorial, I explicitly set the zPosition to -10 to ensure that the pipes appear behind the ground (due to 1., the implicit version). You can change this value to e.g. +10 and the pipes should appear in front of the ground. 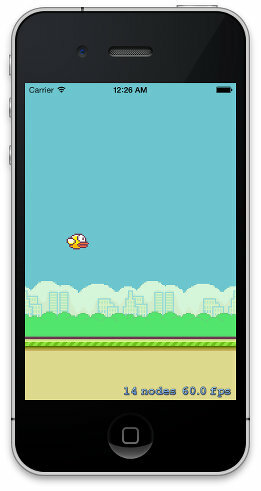 for some reason when my game resets the bird no longer flaps. Have you any advice? @Pure, the SKAction animation runs infinitely, so the only idea I have is that the speed attribute of the _bird is not properly reset to 1. I know you are a busy man. If you could kindly add a tut for adding a stargame/restart ame buttons for this it would be great. Alternatively just some code. I have tried so many different options and I am stuck. Now it’s time to figure out how to make a start game / quit / restart game options! My first attempt at an app and to much success, thank you. I have tried a few things, but alas, I am a total noob. @Mary, hard to say what’s wrong from the distance, I would suggest you take a look at the source code on GitHub and compare it to yours. Thank you so much for the tutorial. I was wondering if maybe you or someone else could explain more in depth the logic behind the scrolling ground/sky code? Especially the for loop. I am just struggling to understand how you are going about doing it. Had a couple of crazy code placements, all fixed now. Can anyone explain to me how the game restarts, in terms of the code used. I mean that you add a BOOL and then change the value to a YES when you collide, then if you click again then you run the [self resetScene]. But in resetScene function you remove all the pipes not but how do you create all the pipes again? Could someone specially point the code that is creating all the pipes again after you collide? I am new to sprite kit so any help would be great. I did the tutorial, and all works fine. Now I have the latest SpriteBuilder (1.3.1) and it crashes on build after publishing. 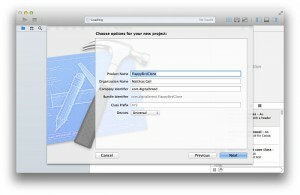 Then I updated Cocos with SpriteBuilder and it won’t build. Any ideas as to why? Hi! Good night thanks for all the help you post in your page!its just awesome!! Im making a game with your flappy basis, but i have 2 questions that i cant implement,how can i spawn pipes with the fisrt delay? I mean that i dont have to wait a little bit for the forst pipes to appear? And how can i set the bounds for the bird? Because when i touch the screen for the bird to flap too much it goes of the screen. THANKS A LOT BY THE WAY cheers from South America!! Commenters: why ask for multiplayer and other features like menus? There are infinite possibilities. How about a click adjuster menu? Part of the fun is developing new features like that. This is a good starting point for any game, so maybe start from scratch?